An item on the agenda of today’s council meeting is this pdf from the staff recommending this (extract above). 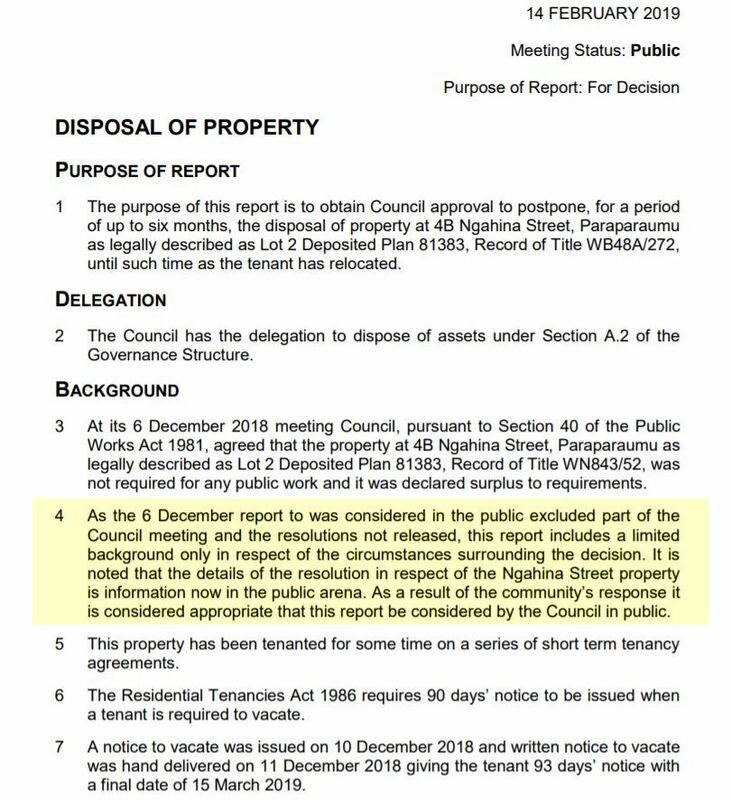 Although the council wanted to keep this intended eviction secret at its meeting of last 6 December, details of it were made public by Mayoral candidate Gwynn Compton and former Mayor Iride McCloy. Obviously, council bosses know that trying to keep their callous behaviour secret is pointless, although oddly the council wants the minutes of the secret session of 6 December kept secret, despite everyone knowing what it was about — perhaps a certain councilor is embarrassed about the fact the decision was unanimous? So how much is this house worth, and how good an investment has it been? In a surprise move at Council this morning a public paper on allowing a large family to temporary stay in their Council home in central Paraparaumu was withdrawn by the Mayor without any explanation. The great and the good of the community including St Vincent de Paul, the Housing Task Force, Grey Power and Community Board members trundled along to speak in support of the paper. Unbeknown to them Councillors in another secret briefing earlier had decided to withdraw the paper. Did we see smirks on the faces of some around the table knowing that the speakers were wasting their time? This item was withdrawn from the agenda of todays additional council meeting..
As I understand it, the situation is that the social housing account is some $500,000.00 in the red, but I would like to be proved wrong. Unlike the water meters where the council can and does lob an extra charge on the cost of water, there seems to be no way of recovering any social housing shortfall – how it happened in the first place needs to be explained by the council. If social housing falls on the government (taxpayer) to manage, it seems to make no sense for councils (ratepayers) to have a dabble as well. It may well be best to leave it to the government to manage and sell off the houses to clear the debt, thus saving the very long suffering ratepayer further angst. Like it or not we should have an austerity program to deal with the excessive debt that the council has got us all into. See the post https://waikanaewatch.org/2019/02/11/iride-mccloy-responds-to-the-mayor-on-social-housing/ for considerations of this issue. The lower-than-market-rentals apply to the pensioner housing flats. The occupants of this house were paying a ‘market rental’. We will submit an OI request for information about your question. May not make any difference how much is paid in rent as the governments accommodation allowance is meant to be available. Surely its best to have the taxpayer pay than the ratepayer – maybe this is what is at the heart of why the account is so much in the red.